One fan in a Hartford Whalers T-shirt didn't do anything but close his hand to earn a game ball from Tuesday night's Blue Jays-Red Sox game. Dioner Navarro's hit took a weird bounce off the field, heading towards the seats for an eventual ground-rule double, but Whalers Dude wasn't fazed. 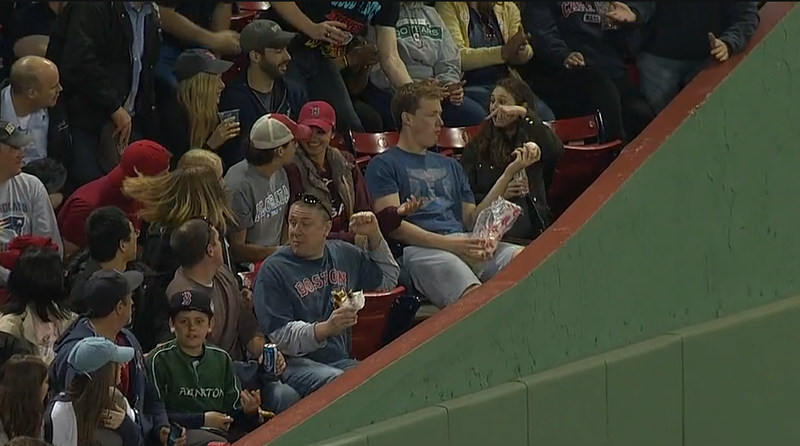 He didn't even stop chewing his food as he caught the ball with one hand before nonchalantly handing it to the girl next to him. It's been a good week for fans getting baseballs at MLB games.